Fairfield Central Business District – French-Reneker-Associates, Inc. The City of Fairfield completed a three-phase paving and streetscape project in their Central Business District. The purpose of this project was to enhance the overall appearance of the Central Business District particularly around the Fairfield Arts and Convention Center. The overall goal of the completed project is to draw more people to the businesses, facilities, and attractions in the area. The three-phase project included improvements to six blocks of streets and Fairfield’s “Art Alley.” The improvements included adding 55 new parking spaces to serve the Fairfield Arts and Convention Center, new decorative and functional street lighting, street reconstruction, the addition of 18 landscape nodes, park benches, bicycle racks, and trash receptacles. Brick pavers and stamped concrete were used to enhance many of the sidewalks and walkways. Being in the City’s Central Business District and in front of the newly constructed Fairfield Arts and Convention Center, public relations were a large part of making this project proceed smoothly. Phases one, two, and three had a total cost of $1,292,000. French-Reneker-Associates managed the project concept, design, and construction administration on this project. 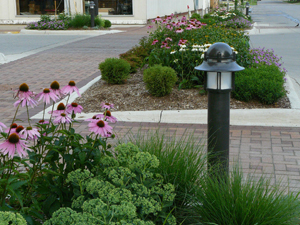 A subconsultant provided landscape architecture services.